Scalabrinian Missionary, is the Director of the Scalabrini International Migration Institute (SIMI) in Rome, a tenured professor at the Pontificia Univesitas Urbaniana in Rome, Italy; a visiting professor at the Universidad de Valencia in Valencia, Spain as well as at the Universidad Autónoma de Zacatecas in Zacatecas, Mexico. He is also the Director of the SIMN Development Office for Europe and Africa. 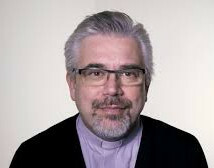 He was counsel to the Episcopal Commission for Migrations of Chile (INCAMI) in Santiago de Chile (1994-1996) and director of the Migration Department of the Archdioceses of Buenos Aires (1997-2002). He was also director of the Scalabrini Migration Center (SMC) in Manila, Philippines (2002-2010). He obtained his bachelor’s in Philosophy at the Faculty of Philosophy “Scalabrini” in Loreto (Italy) in 1986 and his bachelor’s in Theology at the Pontificia Universitas Gregoriana in Rome in 1991. At the same university, Fabio completed his master’s (1994) and doctorate in Church History (1998), with specialization in Contemporary History. Currently he is Under Secretary for Migrants and Refugees in the Vatican.